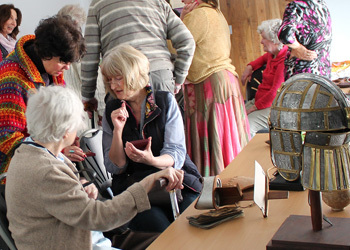 We endeavour to provide new opportunities for those people living with Dementia, as well as their carers, to discover more about our collections and the development of Chichester over time by meeting our staff, sharing their stories and getting hands-on with some objects from our collection. The museum can run specialised Dementia friendly sessions which are led by fully trained staff who have extensive experience in leading activities for people with Dementia. "I've had a really lovely time; I shall come back again hopefully. We've been made to feel very welcome." "It's been really nice, nice to be able to touch - it's the best bit!" A 45 minute informal and interactive tour of the museum. Staff will discuss some of our favourite objects and stories, and provide the opportunity to handle various artefacts. Price is £4 per person including refreshments. As well as scheduled sessions at the museum, we can arrange bespoke sessions for care homes, support groups and other groups who are interested in the History of Chichester, the museum's collections, The Guildhall or finding out about the important work museums do. The following link is a useful guide created by Jane Sandwood on ways to help prevent dementia .